Sir Joseph Williamson, PRS (25 July 1633 – 3 October 1701) was an English civil servant, diplomat and politician who sat in the House of Commons of England variously between 1665 and 1701 and in the Irish House of Commons between 1692 and 1699. He was Secretary of State for the Northern Department 1674-9. Williamson was born at Bridekirk, near Cockermouth in Cumberland, where his father, also called Joseph, was vicar. His father died when he was very young, and his mother remarried the Reverend John Ardery. His relatively humble origins were often referred to unkindly in later life by his enemies. He was educated at St. Bees School, Westminster School and Queen's College, Oxford, of which he became a fellow. In 1660 he entered the service of the Secretary of State for the Southern Department, Sir Edward Nicholas, retaining his position under the succeeding secretary, Sir Henry Bennet, afterwards Earl of Arlington. He was involved with the foundation of the London Gazette in 1665. 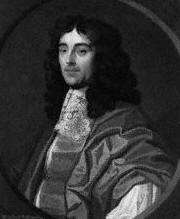 Williamson was elected Member of Parliament for Thetford in 1669 and held the seat until 1685. No less than three previous attempts to enter Parliament had been unsuccessful, due to an increasing "backlash" against Government candidates. Samuel Pepys in his celebrated Diary records that when Williamson appeared at the hustings in 1666, he was shouted down by cries of "No courtiers!" In 1672 he was made one of the clerks of the council and a knight. During the Third Anglo-Dutch War, he drew up plans for the Zealand Expedition which was intended to land a newly formed English Army in the Netherlands. The strategy was abandoned after the naval defeat at the Battle of Texel and the Treaty of Westminster which ended the war. In 1673 and 1674 he represented his country at the Congress of Cologne, and in the latter year he became Secretary of State for the Northern Department, having practically purchased this position from Arlington for £6,000, a sum that he required from his successor when he left office in 1679. In 1677, he became the third President of the Royal Society, but his main interests, after politics, were in antiquarian rather than in scientific matters. Just before his removal from the post of Secretary of State, he was arrested on a charge of being implicated in the Popish Plot, but he was at once released by order of Charles II. Williamson was a particular target of the informers because he was one of the few Ministers who openly disbelieved in the Plot: when Israel Tonge first approached him with "information", Williamson, who believed that Tonge was insane, gave him a "rude repulse". As for the other informers, several of whom were members of London's criminal underworld, his efficient intelligence service probably told him everything necessary about their characters. For this reason, the King, who was equally sceptical about the Plot's reality, wished to retain his services, at least in the short term. The actual charge made against Williamson, of commissioning Roman Catholic army officers, was entirely spurious since these officers were intended for foreign service. Williamson's nerve began to give way under the strain of the Plot, and he soon became a political liability. Charles finally dismissed him after he gave orders to search Somerset House, the Queen's official residence, without the King's permission; the King, "in great anger" told him that "I marvel at your effrontery in searching my house... your head is turning.....I do not wish to be served by a man who fears anyone more than me". Danby was suspected by many of having a part in Williamson's downfall, as he was said to have taken offence at Williamson's recent marriage to Lady Clifton, a wealthy widow and cousin of the King. His marriage, at the beginning of the Popish Plot, should on the face of it have strengthened him politically: his wife was Katherine Stewart, Baroness Clifton, daughter of George Stewart, 9th Seigneur d'Aubigny, and sister of Charles Stewart, 3rd Duke of Richmond, of a junior branch of the Stuart dynasty. Her first husband, by whom she had several children, was Henry O'Brien, Lord Ibrackan, an old friend of Williamson; she and Williamson had no children. Despite the advantages of the match, John Evelyn reported that it was very unpopular, and it probably weakened Williamson politically. Since Katherine as well as her first husband was an old friend of Williamson she was not a surprising choice as a bride; but the fact that O'Brien had been dead for only three months when she remarried gave rise to ill-natured gossip that Williamson and Katherine had been lovers during her first marriage: "'Tis said they live together less happily than before they married" ran one gibe. More seriously in an age of marked class distinctions, it was considered improper that the sister of a Royal Duke should marry a clergyman's son, and even her children are said to have objected to the marriage. Danby, who reportedly thought that Katherine would be a good match for his own son, was suspected of having had a hand in Williamson's downfall. After a period of comparative inactivity Sir Joseph represented England at the Congress of Nijmegen, and in 1678 he signed the first treaty for the partition of the Spanish Monarchy. In 1690, Williamson was elected Member of Parliament for Rochester and held the seat until 1701. He was also elected MP for Thetford in three separate elections, but each time chose to sit for Rochester instead. Between 1692 and 1695, Williamson was also MP in the Irish House of Commons for Clare. In 1695 he represented Portarlington for few months and subsequently Limerick City until 1699. Williamson died at Cobham, Kent, on 3 October 1701, and was buried in Westminster Abbey, where his widow joined him a year later. He had become very rich by taking advantage of the many opportunities of making money which his official position gave him; and despite heavy debts left by her brother, his wife is also said to have brought him a fortune. He left £6,000 and his library to Queen's College, Oxford; £5,000 to found a school at Rochester, Sir Joseph Williamson's Mathematical School; and £2,000 to Thetford. A great number of Williamson's letters, dispatches, memoranda, etc., are among the English state papers. He has been described as one of the great English civil servants of his time, and is credited with building up an intelligence service as efficient as that which John Thurloe had operated under Oliver Cromwell. Despite his gifts he was not popular, being described as dry, formal and arrogant, an uncertain friend and a harsh employer. On the other hand, his will, in which he remembered all those who had a claim on him, suggests that he did not lack a certain generosity of character; and he was capable of lifelong friendships, notably with Samuel Pepys. He is a recurring character in the Thomas Chaloner series of mystery novels by Susanna Gregory, in which he plays a somewhat villainous role : his wife and her first husband appear in the seventh book in the series, The Piccadilly Plot. Seccombe, Thomas (1900). "Williamson, Joseph". In Lee, Sidney. Dictionary of National Biography. 62. London: Smith, Elder & Co.